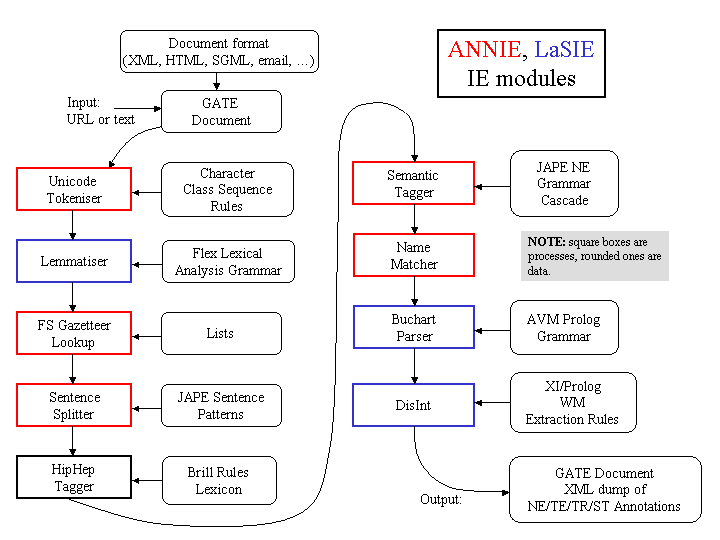 GATE is distributed with an IE system called ANNIE, A Nearly-New IE system (developed by Hamish Cunningham, Valentin Tablan, Diana Maynard, Kalina Bontcheva, Marin Dimitrov and others). ANNIE relies on ﬁnite state algorithms and the JAPE language (see Chapter 8). ANNIE components form a pipeline which appears in ﬁgure 6.1. ANNIE components are included with GATE (though the linguistic resources they rely on are generally more simple than the ones we use in-house). The rest of this chapter describes these components. The document reset resource enables the document to be reset to its original state, by removing all the annotation sets and their contents, apart from the one containing the document format analysis (Original Markups). An optional parameter, keepOriginalMarkupsAS, allows users to decide whether to keep the Original Markups AS or not while reseting the document. The parameter annotationTypes can be used to specify a list of annotation types to remove from all the sets instead of the whole sets. Alternatively, if the parameter setsToRemove is not empty, the other parameters except annotationTypes are ignored and only the annotation sets speciﬁed in this list will be removed. If annotationTypes is also speciﬁed, only those annotation types in the speciﬁed sets are removed. In order to specify that you want to reset the default annotation set, just click the "Add" button without entering a name – this will add <null> which denotes the default annotation set. This resource is normally added to the beginning of an application, so that a document is reset before an application is rerun on that document. The tokeniser splits the text into very simple tokens such as numbers, punctuation and words of diﬀerent types. For example, we distinguish between words in uppercase and lowercase, and between certain types of punctuation. The aim is to limit the work of the tokeniser to maximise eﬃciency, and enable greater ﬂexibility by placing the burden on the grammar rules, which are more adaptable. Details about the primitive constructs available are given in the tokeniser ﬁle (DefaultTokeniser.Rules). It states that the sequence must begin with an uppercase letter, followed by zero or more lowercase letters. This sequence will then be annotated as type ‘Token’. The attribute ‘orth’ (orthography) has the value ‘upperInitial’; the attribute ‘kind’ has the value ‘word’. A number is deﬁned as any combination of consecutive digits. There are no subdivisions of numbers. Two types of symbol are deﬁned: currency symbol (e.g. ‘$’, ‘£’) and symbol (e.g. ‘&’, ‘ ’). These are represented by any number of consecutive currency or other symbols (respectively). Three types of punctuation are deﬁned: start_punctuation (e.g. ‘(’), end_punctuation (e.g. ‘)’), and other punctuation (e.g. ‘:’). Each punctuation symbol is a separate token. White spaces are divided into two types of SpaceToken - space and control - according to whether they are pure space characters or control characters. Any contiguous (and homogeneous) set of space or control characters is deﬁned as a SpaceToken. The above description applies to the default tokeniser. However, alternative tokenisers can be created if necessary. The choice of tokeniser is then determined at the time of text processing. The English Tokeniser is a processing resource that comprises a normal tokeniser and a JAPE transducer (see Chapter 8). The transducer has the role of adapting the generic output of the tokeniser to the requirements of the English part-of-speech tagger. One such adaptation is the joining together in one token of constructs like “ ’30s”, “ ’Cause”, “ ’em”, “ ’N”, “ ’S”, “ ’s”, “ ’T”, “ ’d”, “ ’ll”, “ ’m”, “ ’re”, “ ’til”, “ ve”, etc. Another task of the JAPE transducer is to convert negative constructs like “don’t” from three tokens (“don”, “ ’ “ and “t”) into two tokens (“do” and “n’t”). The English Tokeniser should always be used on English texts that need to be processed afterwards by the POS Tagger. The role of the gazetteer is to identify entity names in the text based on lists. The ANNIE gazetteer is described here, and also covered in Chapter 13 in Section 13.2. The gazetteer lists used are plain text ﬁles, with one entry per line. Each list represents a set of names, such as names of cities, organisations, days of the week, etc. An index ﬁle (lists.def) is used to access these lists; for each list, a major type is speciﬁed and, optionally, a minor type. It is also possible to include a language in the same way (fourth column), where lists for diﬀerent languages are used, though ANNIE is only concerned with monolingual recognition. By default, the Gazetteer PR creates a Lookup annotation for every gazetteer entry it ﬁnds in the text. One can also specify an annotation type (ﬁfth column) speciﬁc to an individual list. In the example below, the ﬁrst column refers to the list name, the second column to the major type, and the third to the minor type. These lists are compiled into ﬁnite state machines. Any text tokens that are matched by these machines will be annotated with features specifying the major and minor types. Grammar rules then specify the types to be identiﬁed in particular circumstances. Each gazetteer list should reside in the same directory as the index ﬁle. So, for example, if a speciﬁc day needs to be identiﬁed, the minor type ‘day’ should be speciﬁed in the grammar, in order to match only information about speciﬁc days; if any kind of date needs to be identiﬁed,the major type ‘date’ should be speciﬁed, to enable tokens annotated with any information about dates to be identiﬁed. More information about this can be found in the following section. and gazetteerFeatureSeparator set to &, the gazetteer will annotate Red Hat as a Lookup with features majorType=company, minorType=software and stockSymbol=RHAT. Note that you do not have to provide the same features for every line in the ﬁle, in particular it is possible to provide extra features for some lines in the list but not others. A URL pointing to the index ﬁle (usually lists.def) that contains the list of pattern lists. The character encoding to be used while reading the pattern lists. The character used to add arbitrary features to gazetteer entries. See above for an example. Should the gazetteer be case sensitive during matching. The document to be processed. The name for annotation set where the resulting Lookup annotations will be created. Should the gazetteer only match whole words? If set to true, a string segment in the input document will only be matched if it is bordered by characters that are not letters, non spacing marks, or combining spacing marks (as identiﬁed by the Unicode standard). Should the gazetteer only match the longest possible string starting from any position. This parameter is only relevant when the list of lookups contains proper preﬁxes of other entries (e.g when both ‘Dell’ and ‘Dell Europe’ are in the lists). The default behaviour (when this parameter is set to true) is to only match the longest entry, ‘Dell Europe’ in this example. This is the default GATE gazetteer behaviour since version 2.0. Setting this parameter to false will cause the gazetteer to match all possible preﬁxes. The sentence splitter is a cascade of ﬁnite-state transducers which segments the text into sentences. This module is required for the tagger. The splitter uses a gazetteer list of abbreviations to help distinguish sentence-marking full stops from other kinds. Each sentence is annotated with the type ‘Sentence’. Each sentence break (such as a full stop) is also given a ‘Split’ annotation. It has a feature ‘kind’ with two possible values: ‘internal’ for any combination of exclamation and question mark or one to four dots and ‘external’ for a newline. The sentence splitter is domain and application-independent. There is an alternative ruleset for the Sentence Splitter which considers newlines and carriage returns diﬀerently. In general this version should be used when a new line on the page indicates a new sentence). To use this alternative version, simply load the main-single-nl.jape from the default location instead of main.jape (the default ﬁle) when asked to select the location of the grammar ﬁle to be used. The RegEx sentence splitter is an alternative to the standard ANNIE Sentence Splitter. Its main aim is to address some performance issues identiﬁed in the JAPE-based splitter, mainly do to with improving the execution time and robustness, especially when faced with irregular input. As its name suggests, the RegEx splitter is based on regular expressions, using the default Java implementation. text fragments that might be seen as splits but they should be ignored (such as full stops occurring inside abbreviations). The new splitter comes with an initial set of patterns that try to emulate the behaviour of the original splitter (apart from the situations where the original one was obviously wrong, like not allowing sentences to start with a number). The name for annotation set where the resulting Split and Sentence annotations will be created. The tagger [Hepple 00] is a modiﬁed version of the Brill tagger, which produces a part-of-speech tag as an annotation on each word or symbol. The list of tags used is given in Appendix G. The tagger uses a default lexicon and ruleset (the result of training on a large corpus taken from the Wall Street Journal). Both of these can be modiﬁed manually if necessary. Two additional lexicons exist - one for texts in all uppercase (lexicon_cap), and one for texts in all lowercase (lexicon_lower). To use these, the default lexicon should be replaced with the appropriate lexicon at load time. The default ruleset should still be used in this case. The ANNIE Part-of-Speech tagger requires the following parameters. outputASName - The name of the annotation set used for output (run-time). This is an optional parameter. If user does not provide any value, new annotations are created under the default annotation set. baseSentenceAnnotationType - The name of the annotation type that refers to Sentences in a document (run-time, default = Sentence). posTagAllTokens - If set to false, only Tokens within each baseSentenceAnnotationType will be POS tagged (run-time, default = true). failOnMissingInputAnnotations - if set to false, the PR will not fail with an ExecutionException if no input Annotations are found and instead only log a single warning message per session and a debug message per document that has no input annotations (run-time, default = true). then - New features are added on existing annotations of type ‘baseTokenAnnotationType’. otherwise - Tagger searches for the annotation of type ‘outputAnnotationType’ under the ‘outputASName’ annotation set that has the same oﬀsets as that of the annotation with type ‘baseTokenAnnotationType’. If it succeeds, it adds new feature on a found annotation, and otherwise, it creates a new annotation of type ‘outputAnnotationType’ under the ‘outputASName’ annotation set. ANNIE’s semantic tagger is based on the JAPE language – see Chapter 8. It contains rules which act on annotations assigned in earlier phases, in order to produce outputs of annotated entities. Note that some of these feature values are generated automatically from the gazetteer lists, so if you alter the gazetteer list deﬁnition ﬁle, these could change. Note also that other annotations, features and values are also created by ANNIE which may be left for debugging purposes: for example, most annotations have a rule feature that gives information about which rule(s) ﬁred to create the annotation. The Unknown annotation type is used by the Orthomatcher module (see 6.8) and consists of any proper noun not already identiﬁed. The Orthomatcher module adds identity relations between named entities found by the semantic tagger, in order to perform coreference. It does not ﬁnd new named entities as such, but it may assign a type to an unclassiﬁed proper name (an Unknown annotation), using the type of a matching name. The matching rules are only invoked if the names being compared are both of the same type, i.e. both already tagged as (say) organisations, or if one of them is classiﬁed as ‘unknown’. This prevents a previously classiﬁed name from being recategorised. Input – entity annotations, with an id attribute. Output – matches attributes added to the existing entity annotations. A lookup table of aliases is used to record non-matching strings which represent the same entity, e.g. ‘IBM’ and ‘Big Blue’, ‘Coca-Cola’ and ‘Coke’. There is also a table of spurious matches, i.e. matching strings which do not represent the same entity, e.g. ‘BT Wireless’ and ‘BT Cellnet’ (which are two diﬀerent organizations). The list of tables to be used is a load time parameter of the orthomatcher: a default list is set but can be changed as necessary. The wrapper builds an array of the strings, types and IDs of all name annotations, which is then passed to a string comparison function for pairwise comparisons of all entries. The ﬁrst two modules are helper submodules for the pronominal one, because they do not perform anything related to coreference resolution except the location of quoted fragments and pleonastic it occurrences in text. They generate temporary annotations which are used by the pronominal submodule (such temporary annotations are removed later). antecedent oﬀset - this is the oﬀset of the starting node for the annotation (entity) which is proposed as the antecedent, or null if no antecedent can be proposed. matches - this is a list of annotation IDs that comprise the coreference chain comprising this anaphor/antecedent pair. The quoted speech submodule identiﬁes quoted fragments in the text being analysed. The identiﬁed fragments are used by the pronominal coreference submodule for the proper resolution of pronouns such as I, me, my, etc. which appear in quoted speech fragments. The module produces ‘Quoted Text’ annotations. The submodule itself is a JAPE transducer which loads a JAPE grammar and builds an FSM over it. The FSM is intended to match the quoted fragments and generate appropriate annotations that will be used later by the pronominal module. The JAPE grammar consists of only four rules, which create temporary annotations for all punctuation marks that may enclose quoted speech, such as ", ’, ‘, etc. These rules then try to identify fragments enclosed by such punctuation. Finally all temporary annotations generated during the processing, except the ones of type ‘Quoted Text’, are removed (because no other module will need them later). The pleonastic it submodule matches pleonastic occurrences of ‘it’. Similar to the quoted speech submodule, it is a JAPE transducer operating with a grammar containing patterns that match the most commonly observed pleonastic it constructs. Preprocess the current document. This step locates the annotations that the submodule need (such as Sentence, Token, Person, etc.) and prepares the appropriate data structures for them. Create the coreference chains from the individual anaphor/antecedent pairs and the coreference information supplied by the OrthoMatcher (this step is performed from the main coreference module). Full details of the pronominal coreference algorithm are as follows. Identifying the sentences in the document being processed. The sentences are identiﬁed with the help of the Sentence annotations generated from the Sentence Splitter. For each sentence a data structure is prepared that contains three lists. The lists contain the annotations for the person/organization/location named entities appearing in the sentence. The named entities in the sentence are identiﬁed with the help of the Person, Location and Organization annotations that are already generated from the Named Entity Transducer and the OrthoMatcher. The gender of each person in the sentence is identiﬁed and stored in a global data structure. It is possible that the gender information is missing for some entities - for example if only the person family name is observed then the Named Entity transducer will be unable to deduce the gender. In such cases the list with the matching entities generated by the OrhtoMatcher is inspected and if some of the orthographic matches contains gender information it is assigned to the entity being processed. The identiﬁed pleonastic it occurrences are stored in a separate list. The ‘Pleonastic It’ annotations generated from the pleonastic submodule are used for the task. For each quoted text fragment, identiﬁed by the quoted text submodule, a special structure is created that contains the persons and the 3rd person singular pronouns such as ‘he’ and ‘she’ that appear in the sentence containing the quoted text, but not in the quoted text span (i.e. the ones preceding and succeeding the quote). Retrieving all the pronouns in the document. Pronouns are represented as annotations of type ‘Token’ with feature ‘category’ having value ‘PRP$’ or ‘PRP’. The former classiﬁes possessive adjectives such as my, your, etc. and the latter classiﬁes personal, reﬂexive etc. pronouns. The two types of pronouns are combined in one list and sorted according to their oﬀset in the text. If the pronoun is ‘it’, then the module performs a check to determine if this is a pleonastic occurrence. If it is, then no further attempt for resolution is made. The proper context is determined. The context size is expressed in the number of sentences it will contain. The context always includes the current sentence (the one containing the pronoun), the preceding sentence and zero or more preceding sentences. Depending on the type of pronoun, a set of candidate antecedents is proposed. The candidate set includes the named entities that are compatible with this pronoun. For example if the current pronoun is she then only the Person annotations with ‘gender’ feature equal to ‘female’ or ‘unknown’ will be considered as candidates. From all candidates, one is chosen according to evaluation criteria speciﬁc for the pronoun. Retrieves the anaphor/antecedent pairs generated from them. For each pair, the orthographic matches (if any) of the antecedent entity is retrieved and then extended with the anaphor of the pair (i.e. the pronoun). The result is the coreference chain for the entity. The coreference chain contains the IDs of the annotations (entities) that co-refer. A new Coreference annotation is created for each chain. The annotation contains a single feature ‘matches’ whose value is the coreference chain (the list with IDs). The annotations are exported in a pre-speciﬁed annotation set. Context inspected is not very big - cases where the antecedent is found more than 3 sentences back from the anaphor are rare. Recency factor is heavily used - the candidate antecedents that appear closer to the anaphor in the text are scored better. Anaphora have higher priority than cataphora. If there is an anaphoric candidate and a cataphoric one, then the anaphoric one is preferred, even if the recency factor scores the cataphoric candidate better. Inspect the context of the anaphor for candidate antecedents. Every Person annotation is consider to be a candidate. Cases where she/her refers to inanimate entity (ship for example) are not handled. For each candidate perform a gender compatibility check - only candidates having ‘gender’ feature equal to ‘unknown’ or compatible with the pronoun are considered for further evaluation. Evaluate each candidate with the best candidate so far. If the two candidates are anaphoric for the pronoun then choose the one that appears closer. The same holds for the case where the two candidates are cataphoric relative to the pronoun. If one is anaphoric and the other is cataphoric then choose the former, even if the latter appears closer to the pronoun. There is no gender compatibility restriction. In the case in which there are several candidates in the context, the gender compatibility restriction is very useful for rejecting some of the candidates. When no such restriction exists, and with the lack of any syntactic or ontological information about the entities in the context, the recency factor plays the major role in choosing the best antecedent. The number of nominal antecedents (i.e. entities that are not referred by name) is much higher compared to the number of such antecedents for she, he, etc. In this case trying to ﬁnd an antecedent only amongst named entities degrades the precision a lot. the part of the sentence preceding the sentence where the quote originates, which is not included in other quote. It is worth noting that contrary to other pronouns, the antecedent for I, me, my and myself is most often cataphoric or if anaphoric it is not in the same sentence with the quoted fragment. Locate the quoted fragment description that contains the pronoun. If the pronoun is not contained in any fragment then return without proposing an antecedent. Inspect the context for the quoted fragment (as deﬁned above) for candidate antecedents. Candidates are considered annotations of type Pronoun or annotations of type Token with features category = ‘PRP’, string = ‘she’ or category = ‘PRP’, string = ‘he’. Try to locate a candidate in the text succeeding the quoted fragment (ﬁrst pattern). If more than one candidate is present, choose the closest to the end of the quote. If a candidate is found then propose it as antecedent and exit. Try to locate a candidate in the text preceding the quoted fragment (third pattern). Choose the closest one to the beginning of the quote. If found then set as antecedent and exit. Try to locate antecedents in the unquoted part of the sentence preceding the sentence where the quote starts (second pattern). Give preference to the one closest to the end of the quote (if any) in the preceding sentence or closest to the sentence beginning. Let us take an example of a 3-stage procedure using the tokeniser, gazetteer and named-entity grammar. Suppose we wish to recognise the phrase ‘800,000 US dollars’ as an entity of type ‘Number’, with the feature ‘money’. First of all, we give an example of a grammar rule (and corresponding macros) for money, which would recognise this type of pattern. The tokeniser separates this phrase into the following tokens. In general, a word is comprised of any number of letters of either case, including a hyphen, but nothing else; a number is composed of any sequence of digits; punctuation is recognised individually (each character is a separate token), and any number of consecutive spaces and/or control characters are recognised as a single spacetoken.